Home › Home and Kitchen › New Drench Shiv-R Kitchen Grade Vacuum Insulated Double Wall Stainless Steel ..
New Drench Shiv-R Kitchen Grade Vacuum Insulated Double Wall Stainless Steel ..
Ultra Premium Durable Construction: Made of kitchen-grade, 304 18/8 stainless steel with an attractive, modern polished finish that resists sweat to prevent slippage. Extra large 30 oz size holds 2 (12oz) Beers at one time! Maintains Tested and Reliable Temperature Retention: Double walled construction keeps cold and hot beverages at the perfect temp for Hours Longer than single walled! Great for sports drinks, beer, soup, coffee & more. Superior Seamless Antibacterial Design: Unlike other brands, our Electro Polished tumbler outside and inside walls are completely Seamless. Nothing trapping bacteria or contamination. No unwanted taste, only clean Drench drinking! Savor your favorite hot or cold beverages on the go, at your own pace! This stylish insulated tumbler retains the temperature of its contents for hours on end. 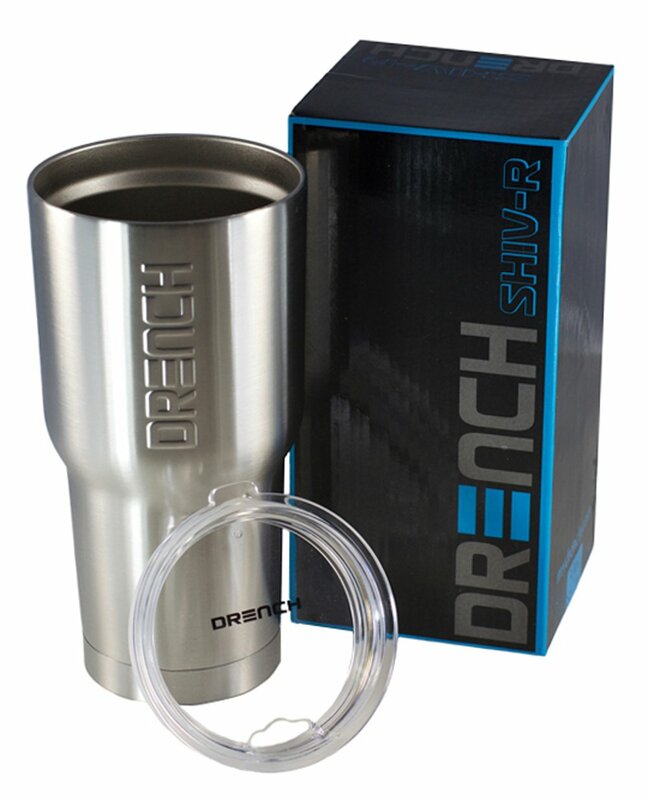 Tired of travel mugs that don't keep your hot drinks hot or cold drinks cold?The DRENCH SHIV-R Insulated Stainless Steel Tumbler solves this dilemma onceand for all! Featuring durable double walled construction and a BPA-freeplastic lid, our mug retains the temperature of its contents MUCH LONGERthan single walled tumblers! Use it to transport everything from coffee, tea& soup to sports drinks, juice, and even beer & cocktails! Why is our tumbler different? Beyond rugged materials that stand up to dailyuse & abuse, its innovative design eliminates the typical inner seam thatleads to nasty bacteria buildup. And finally, the DRENCH SHIV-R InsulatedStainless Steel Tumbler simply looks great! It has a sleek, polished silverfinish as well as a high-quality embossed logo instead of stickers that canfade or peel off over time. Larger capacity than other brands (30 oz) Solid stainless steel construction Double walled for superior insulation No-seam design resists bacteria buildup Bpa free lid included (straw not included) Sweat-resistant finish enhances grip Versatile uses HAND WASH ONLY Makes a GREAT GIFT A Veteran Owned Company Check out our DRENCH SHiV-R ACCESSORY BUNDLE for sale on Amazon Click 'Add to Cart' to buy now!